The appetite for fitness trackers may be slowly diminishing as smartwatches start to displace them, but for the time being there’s plenty of juice for Garmin, Fitbit and others to squeeze out of the market. The Garmin Vivosmart 4 is Garmin’s latest, a slim fitness tracker that faces up against rivals by trying out some new ideas. This is Garmin’s first fitness tracker to offer a pulse oxygen sensor. The feature debuted in the Fenix 5X Plus earlier this year with hikers in mind (oxygen saturation decreases with ascent) but here it’s being used as a day-to-day biometric measurement. The Vivosmart 4 also marks the debut of Garmin’s Body Battery feature, which measures your body reserves and tells you how much energy you have left, based on a collection of metrics. Together they make for an intriguing little device, but the competition is stiffer than ever, especially with the Fitbit Charge 3 now on the scene. How does the Vivosmart 4 shape up? Here’s our verdict. For a long time Garmin’s been making fitness trackers that are small and comfortable to wear. The Vivosmart 4 is no different, with two options to choose from: the small/medium measures 15 x 10.5 x 197 mm and weighs 16.5g; the large is 15 x 10.5 x 223 mm in dimensions and weighs 17.1g. So yeah, the Vivosmart 4 is pretty light and, I’ve found, unobtrusive day-to-day and even in bed. The smaller version also comes in four colours – blue, grey, berry and black – while the larger one only comes in the black model. Note that you can’t swap these bands out like you can with some other fitness trackers, so choose wisely. Nonetheless it's a major improvement over the Vivosmart 3, which only came in black and purple, neither of which looked as good as anything in this new lineup. That includes the small OLED display which sits on top of the band. This is where you can see the time, check some stats, or start an activity. The display is clearer to read this time and less smudge-prone than the Vivosmart 3. The touch responsiveness is still iffy, however. This time there’s a haptic button below the screen you can tap to open the menu, then it’s a case of swiping up and down and tapping on icons to open things. Yet all too often the screen misreads my taps for swipes, or vice versa, and getting through menus is more often a pain than not. The very narrow screen also means it also struggles to display much information at once, often leaving words and sentences truncated so you have to wait for them to scroll across the tiny display. And when that display gets wet or smudgy? Oh boy, can it become very irritating very quickly. The Vivosmart 3 was the first Garmin tracker to introduce stress tracking, and this time around we’ve got other new toys to play with. Let’s start with the pulse oximeter because I think that’s going to attract a lot of interest. 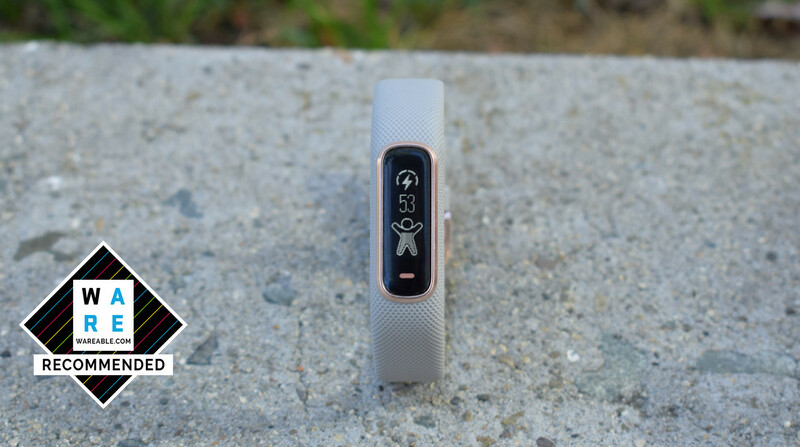 This has been a hot topic on Wareable for the last year or so, with Fitbit bringing its SpO2 tech to its latest devices. SpO2 is a measurement of oxygen saturation and Garmin has stuck sensors into the Vivosmart 4 that track this through the day and night. While Fitbit’s SpO2 sensors are live and actively taking readings, it’s not yet made this data available to users, as it wants to use it to advise people when they may have conditions such as atrial fibrillation or sleep apnea, conditions that pulse oximetry can dig up. To do that it needs FDA approval, something Apple recently obtained for AFib readings on the Watch Series 4. But expect to see this feature enabled on the new Charge 3 in the near future. As for Garmin, it’s not using this data to diagnose or even advise users when patterns in their oxygen saturation could be an indicator of something sinister, so instead it’s just giving you the charts and graphs to make your own inferences (or your doctor’s, should you take it to them). So, how useful does that make it? Probably not hugely unless you notice that your saturation levels are dipping on the regular. Normal values measured by pulse oximetry are 95% or above, and anything under 90% is considered reason for concern. You can take pulse ox readings at any time from the device itself. This requires you to stay as still as possible, preferably holding your wrist up to heart level, while an ominous red light spills over your arm to test how much red and infrared light is absorbed by your blood. But you’ll only get a percentage; there’s no indicator of whether the numbers are good or not. Garmin offers some context in the app when you set up the device, but it’s going to be important for people to understand a) what these numbers mean and b) that these sensors aren’t always accurate. I've spoken to a lot of experts about SpO2, and most have told me that the exact accuracy of the sensor in a moment of time is less important than the trends it records over a long period. More interesting, I think, is that the tracker also takes pulse ox readings when you're asleep, so long as you've enabled this feature in the app. At the end of the night you'll see a graph which, while it will probably fluctuate a little, should stay above 90 for the most part. In the graph below (far right) you can see mine dipped below 90 for a moment one night. Now, I was coming down with a nasty cold that night, and this is something that can affect saturation, so that might have had an effect. Or it was just a case of the sensor going wonky. I'll also add that sleep tracking on the Vivosmart 4 has been pretty good. Fitbit still has the edge here, but Garmin has been catching up, and its new advanced sleep monitoring features mean you get a breakdown of stages through the night. It does still seem to have a problem with sometimes thinking I've gone to sleep if I take it off at night, but on the whole the readings have been decent. For someone who’s healthy, pulse ox is going to be something you check rarely, but for someone suffering from sleep apnea or AFib, the Vivosmart 4 could be a way to detect the signs. The other new health feature is the Body Battery, an indicator of just how much juice you have left in the tank. Think of the Body Battery as a little like Garmin’s training load, which measures the physiological impact of workouts on your body. The Body Battery however doesn’t just take into account your workouts but your entire day and night, assessing whether you’re in good enough shape to exercise – or whether it’s time to take it easy. It makes this judgement by taking into account your stress level (measured using heart rate variability), recent physical activity and how much sleep you’ve been getting – and spits out a percentage as your “battery” level. 80%? You’re fine to squeeze in that after-work run. 35%? You’ve been overdoing it, so best just try for an early night. Your Body Battery level can be viewed on the tracker or in the Connect app, which presents you with a more meaningful graphs so you can see how this level changes through the day. I’ve been keeping an eye on mine in testing, and some of the big contributors are pretty obvious. On one day (see above, far left) I dropped about 30% from a run, meaning I finished the day at about 50%. On another day the lowest I dropped to was 86%, but that drop happened as my stress level spiked dramatically at 7pm – exactly the moment I was running late to meet a friend and was worried about leaving them waiting. The battery adds a more useful dimension to Garmin’s stress tracking feature by illustrating its impact on your wellbeing. And the more it seemed to pick out these correlations, the more I’ve been paying attention to my battery number. The Vivosmart 4’s stable of workouts is nothing compared to what you’ll get in the company’s Fenix line, but its selection should satisfy most casual users. The band can track walking, running, strength training, pool swimming, yoga, elliptical, cardio and Toe-to-Toe, an exercise for parents to do with kids. There’s an ‘Other’ option too if your workout's not on the list. To start a workout you need to open the menu on the Vivosmart 4 and scroll to the activity you want. Again, this can be a fiddly process, especially with sweaty fingers. Now, the big drawback here – and possible dealbreaker – is the lack of GPS. You don't even have a connected GPS option to leech off your phone. So all distance is guesswork using the accelerometer – and it shows. On one run my phone's GPS measured 4.87km while the Vivosmart 4 measured 5.6km. That's quite a big difference. Heart rate accuracy has proven to be better than distance guesswork, keeping up with the Polar H10 chest strap and – during some HIIT training – hitting the peaks and troughs of the chest strap, though a little more slowly. The Vivosmart 4 also tracks your VO2 Max, the maximum amount of oxygen your body can utilize during exercise. Just note that you'll need to do a few workouts to get this calibrated. All of your workout info sits in the Garmin Connect app, which offers a lot of juicy data to get your teeth stuck into. With the addition of body battery and pulse ox readings, the daily overview becomes even more comprehensive. That said, I can see how all these graphs and colours could be overwhelming for some people who just want the facts. Fitbit does a better job of simplifying matters; Garmin lets you dig deeper. But the Vivosmart 4 isn't a tracker designed for people with serious athletic ambitions. Garmin has built a fitness tracker for casual users who want to monitor their fitness levels. Garmin's throwing a lot of data out there – hopefully over time it will help users make better sense of it. It's become standard for Garmin wearables to support smart notifications, and the Vivosmart 4 will buzz you when you get a call, message or a notification from another app. The problem is, you can't choose which third-party apps; you can have them all on or all off. Also, the notification experience… isn't great. The message will scroll vertically down the screen, so you'll need to hold it up as you digest the notification, but it'll only scroll past a couple of times before disappearing – and no way of reading it again. I am however pleased to report that battery life is a better story: seven days with the heart rate monitor continuously. Sure, there are fitness trackers that go longer, but considering everything that the Vivosmart 4 does, a week is not to be sniffed at. The Garmin Vivosmart 4 livens things up with pulse ox detection and the new Body Battery feature, giving you a more comprehensive insight into your level of fitness. The former of those will have less appeal, but all of this makes for a fitness tracker that's evolved well beyond step counts.